Funding is primarily derived from page charges assessed authors, sponsoring organizations or agencies as well as subscriptions from individuals and library’s. 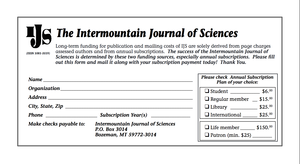 Please download the subscription form below, print it out and mail it in with your payment. The form is high resolution, better-printing version and is available in Adobe Acrobat Portable Document Format (PDF). To view these files in PDF you will need to download the Adobe Acrobat Reader (if it is not already present on your computer). Acrobat and the Acrobat logo are trademarks of Adobe Systems Incorporated.